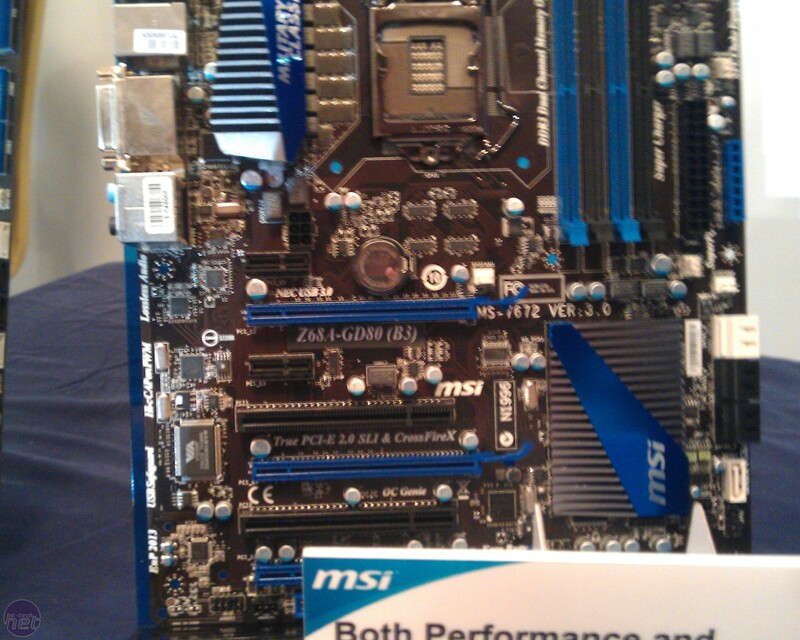 It’s the MSI MOA overclocking event in Istanbul this weekend and the company has been using the event to give us an early look at a board based on Intel’s new Z68 chipset. The new chipset, which is widely rumoured to be dropping on 8 May is set to offer a best-of-both-worlds option for those looking to buy an LGA1155 system. This is because the chipset is known to offer both CPU overclocking and the ability to overclock the on-board GPU, two features that are currently not available in a single LGA1155 chipset. Z68 also looks set to bring support for the performance enhancing RST SSD Caching technology that caches frequently used data from a hard disk to an SSD to increase application boot times and responsiveness. 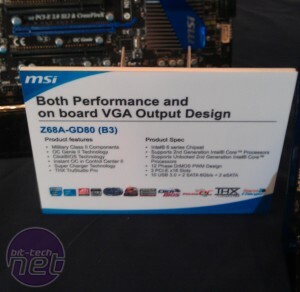 The board on show from MSI today is titled the Z68A-GD80, which indicates it is likely to sit towards the top end of MSI’s range of LGA1155 motherboards. 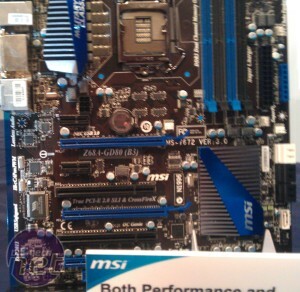 It’s not clear though whether that’s as a result of the positioning of the Z68 as the new premium chipset (replacing the P67) or simply MSI’s choice to show this particular premium board. 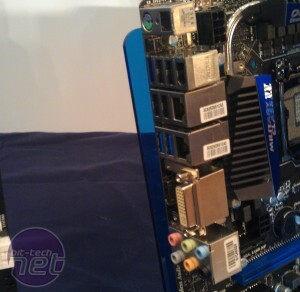 As expected the board has on-board video connections in the shape of a DVI and a HDMI output. 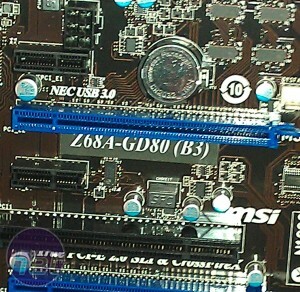 This is interesting as early rumours about the Z68 chipset indicated it would also include support for analogue D-Sub connections too, which is obviously missing from this board. 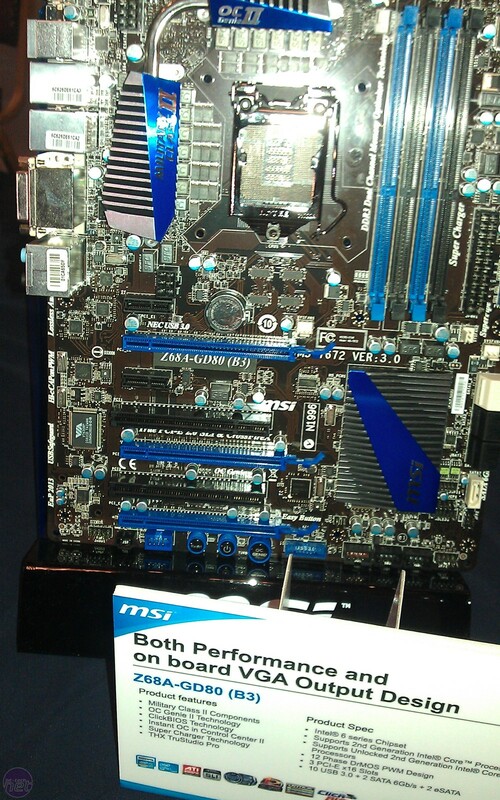 Also worth noting is that the name of the board has been added with a sticker. 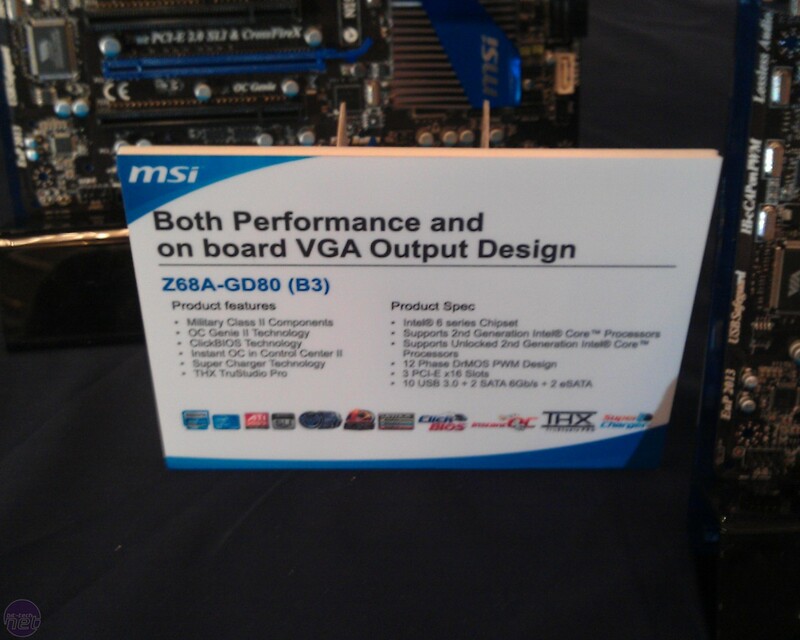 This approach has been used by MSI to use up PCB stocks manufactured before the Sandy Bridge chipset issue (and thus without the (B3) suffix its boards now carry) so this indicates that this PCB may have been manufactured months ago. This is an interesting indication as to how long motherboard manufacturers have had stock of the Z68 chipset and lends weight the the rumour that the release of the chipset has been put back to allow P67 board sales to pick back up after their initial recall. Are you looking forward to the Z68 launch? Do you think Intel is mad releasing a new chipset before sales have had a chance to pick back up? Let us know your thoughts in the forums.